1 of 3 Season tuna with salt and pepper on one side and just salt on the other. Spread rub on a piece of parchment paper, press all sides of tuna into it and shake off excess. 2 of 3 Heat oil in a large skillet over medium-high. Slip tuna into skillet and sear on both sides, about 90 seconds per side for medium-rare. Transfer to a warm plate. 3 of 3 Add vinegar to same skillet and, using a wooden spoon, scrape up bits that have stuck to pan. Add 1/2 cup water, the peppers and onions, and tomato sauce; cook 20 minutes, until liquid is reduced by half. Stir in herbs. 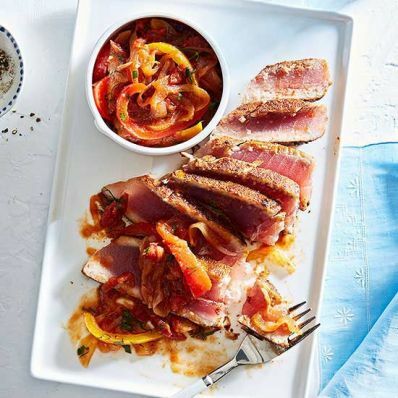 Place each tuna steak on a plate, spoon some sauce over and serve.